Tree Life. 1-3 Day Priority Shipping included. Tree Life is available in 1 gallon containers. Order discounted 4-pack below. Shipping is extra on the 4-pack. 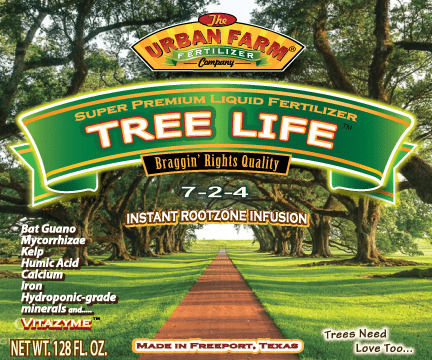 Tree Life is a super-concentrated, instant tree formula that includes Mychorrizae, iron, micro-nutrients, and biologicals derived from bat guano, kelp, and Vitazyme. Use as a drench at the drip line. It's perfect for hose-end and tow-behind tank sprayers. One gallon, once diluted, makes 256 gallons of full-strength nutrient. We craft our proprietary formulas by hand on a weekly basis. Bat guanos, Sea Kelp, Mycorrhizae, Earthworm Castings, Humic Acid, Vitazyme®, Amino acids, and Hydroponic-grade minerals. Mixing rate: 1tbls/gallon, or 1/2oz/gallon using a measuring cup. Buy mixed gallon cases: order any 4-pack of gallons, send us an email with order number, tell us the mix of formulas you want. For instance: 1 gal Veg, 1 gal TTF, 1 gal Flowers, 1 gal Tree Life. Get the discount. Super-concentrated!! One gallon of Tree Life makes 256 gallons of full-strength, ready-to-be-applied nutrient. Frequency and amount of any fertilizer application is variable, due to many factors, such as, temperature, previous fertilizers, type of plant, rainfall, number of irrigation cycles, etc. Over time you develop an eye for it. For tractor-mounted tank spraying use the standard 1 tbls/gallon, (or ½ oz/gallon using a measuring cup). This will give you a full strength solution ready-to-go. Many customers double and even triple the dose, but always test on a small area first and wait 7-10 days to make sure.